The Congress today reiterated its commitment to the coalition politics but, at the same time, sent out a strong message to its allies that they should not go beyond constructive criticism as they also have a responsibility to keep an alliance intact. Was it right to drop Sourav Ganguly for the second cricket Test against Pakistan? Hemmed in by the Left parties and its own commitment to the “garib and aam admi”, the Congress party’s economic resolution today struck a fine balance between liberalisation and its commitment to the welfare of the poor, disadvantaged and the deprived. 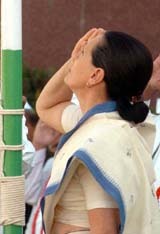 The scene at former Prime Minister and Janata Dal (Secular) National President H.D. Deve Gowda’s house speaks aptly of the political drama being enacted in Karnataka. Gowda may be seen pouting at the betrayal by his son H.D. Kumaraswamy but the mood of his party workers speaks for itself. A woman militant of the Lashkar-e-Toiba (LeT) and her two associates were arrested while two militants killed and five top commanders of the Hizbul Mujahideen surrendered in Jammu and Kashmir in the past 24 hours, an official spokesman said today. An Indian man from Kerala jailed in Saudi Arabia on charges of partially blinding a Saudi national will not have to pay with an eye for his offence. He has been pardoned. The conjoined twins, who underwent a seven-hour surgery at a hospital here tonight, died an hour after being separated, hospital sources said. It was a ‘Black’ night at the 2nd Apsara Film and Television Awards, with Sanjay Leela Bhansali’s tale of relationship between a teacher and deaf blind student running away with all the honours, bagging 10 awards in all, including the one for the best film. Quattrocchi is neither related to Prime Minister Dr Manmohan Singh or the CBI so now it is proved that it is the Italian blood that mattered.